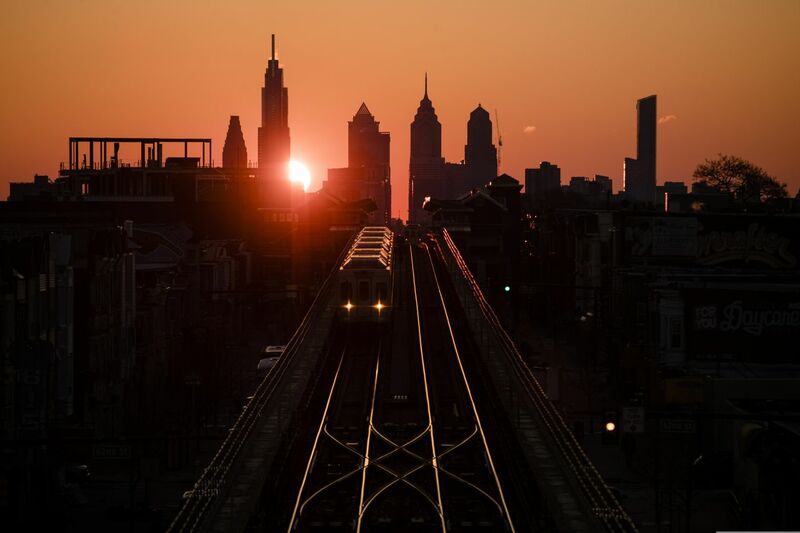 A train heads west as the sun rises from behind the city skyline in Philadelphia, Wednesday, March 6, 2019. Perhaps it was, but it is getting less and less so every day. Housing costs are increasing across the region, especially in the popular central city neighborhoods that talented young creatives have flocked to. While the median list price for the Philadelphia metro remains a fairly reasonable $182,000, according to Trulia, a quick look at the map of real estate prices in the areas surrounding Vernick, in zip code 19103, shows rates many times higher than that. In the blocks just across Walnut Street, median list prices are nearly $600,000, and closer to Rittenhouse Square the median is well over $700,000. I saw several places approaching seven figures. It’s not New York or San Francisco prices yet. But it’s getting there. For the past couple of decades, Philadelphia was the affordable alternative to those two places as well as Boston and D.C. on the Eastern seaboard. That helped make the city a mecca for young people and the creative class of technologists, innovators, professionals, managers, artists, and designers. In the years spanning 2006 and 2012, Philadelphia had the greatest proportional increase in millennials of any major city, with the population of 20- to 34-year-olds increasing by about 100,000 residents, a rate of more than 6 percent per year. The region’s world class colleges and universities are huge magnets for talented young people: All told, the metro is home to more than 340,000 college students, making it the fifth-largest college town in the nation. And through the work of groups like Campus Philly and other local organizations, more and more of those graduates have chosen to stay in the region. The city has also attracted creatives from across the country. A decade or so ago, few would have mentioned Philadelphia as one of the nation’s and world’s leading entrepreneurial ecosystems. But, today, the region ranks in the top dozen in the United States and among the top 25 in the world for venture capital start-up companies, hauling in nearly a billion dollars a year in venture capital investment, similar to Washington, D.C., Tel Aviv, Berlin, and Toronto. But now the city’s revival may be reaching a tipping point. Philadelphia appears to be on the edge of what I have dubbed the New Urban Crisis. If its old urban crisis of the 1970s and 1980s was one of economic decline and dysfunction, its New Urban Crisis is a crisis of success, manifested in accelerated gentrification, rising housing costs, and growing inequality and social division. Philadelphia’s New Urban Crisis is not as extreme as that of New York or San Francisco or L.A. — not yet. But the region ranks eighth on my New Urban Crisis Index, a composite measure of inequality, economic segregation, and housing affordability. And it has the third-highest level of income inequality in the nation among large cities, on par with that of Bolivia and Honduras. This New Urban Crisis is already damaging the city’s much ballyhooed ability to attract the young talent that drove its revival in the first place. The metro’s rate of millennial population growth cratered to less than 4 percent per year from 2010 to 2015, dropping to number 80 of the nation’s large metro areas (a different ranking put us at number one for millennial growth 2006 to 2014). Philadelphia’s challenge is to stop this New Urban Crisis in its tracks before it gets any worse, and create a more widely shared prosperity by and for the city’s residents. That means working with local government, universities, anchor institutions, and other civic organizations to address affordable housing, access to quality education for all Philadelphians, infrastructure, and economic mobility, among many other issues. Not only the well-being of its residents, but the city’s continued ability to grow and prosper, is at stake. Richard Florida is the inaugural Philadelphia Fellow, a yearlong appointment to explore urban issues such as building inclusive economic growth and renewing infrastructure. He is University Professor at University of Toronto’s School of Cities and Rotman School of Management, and Distinguished Fellow at NYU. The author of the best-selling “The Rise of the Creative Class” and “The New Urban Crisis”, he is a Senior Editor with the Atlantic and cofounder of CityLab. Florida’s first keynote as the inaugural Philadelphia Fellow, The Case for Inclusive Prosperity in Philadelphia, is March 26th from 5:30 to 7 p.m. at Thomas Jefferson University, Dorrance H. Hamilton Building, 1001 Locust St., Philadelphia, Pa., 19107. RSVP here. Reception to follow.